This great little BBQ joint opened on Chincoteague a couple of years ago. They have numerous wonderful specialty sandwiches, but if I was hard pressed I would have to say my favorite was “The Clipper”. It’s pulled pork, with a fresh fried boneless chicken breast on top, smothered in (get this), bacon jam. It was love at first bite. The sandwich is so large, it feeds you for about 3 days. Sadly, the place is seasonal, so you aren’t able to get this wonderous sandwich in the fall and winter months. 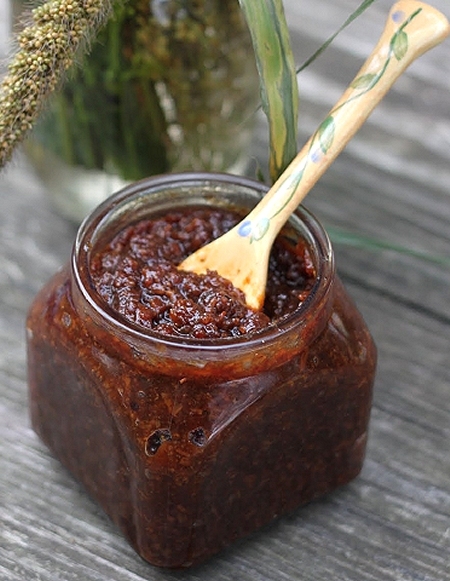 I’d been thinking about recreating the bacon jam at home for over a year now. Well last week I finally broke down and took a swing at it, and it turned out wonderfully! Seemed like the general consensus of the internet pointed to Not Quite Nigella’s recipe. It seemed like a winner to me. I knew the version I had at Woody’s contained bacon, brown sugar, and lots of caramelized onions. The coffee seemed like an interesting addition. Coffee is one of the main ingredients in Red Eye Gravy, which I love. Just like with chocolate, adding coffee doesn’t make it taste like coffee. It just melds with and intensifies the porkiness. I was a little skeptical of the addition of maple syrup, but went ahead and went with it anyways. It is kind of time consuming. It took around 2 hours to cook down to the consistency I wanted. But, once I tasted it, I knew it was well worth the effort. The finished product is not greasy at all. I had expected a ton of fat to settle at the top when I had refrigerated it, but in the morning I was pleasantly surprised to find there was none! Draining most of the bacon grease before cooking the onions takes care of that issue. Since it’s cooked down so much, then pulsed in the food processor, it spreads on toast like a dream. With an over easy or poached egg, and a glass of orange juice it’s an ideal breakfast for the bacon lover without all the mess of frying bacon. It’s also wonderful spread on a crostinis for a quick appetizer. In a dutch oven, fry the bacon in batches until lightly browned and beginning to crisp. Remove to paper towel lined plate and set aside. Drain all but 2 tablespoons of bacon grease out of the pan. Fry the onion and garlic in the rendered bacon fat on medium heat until translucent. Add the bacon to the onions and garlic, and add the rest of the ingredients except for the water. Simmer for 2 hours adding 1/4 of a cup of water every 25-30 minutes or so, and stir regularly. 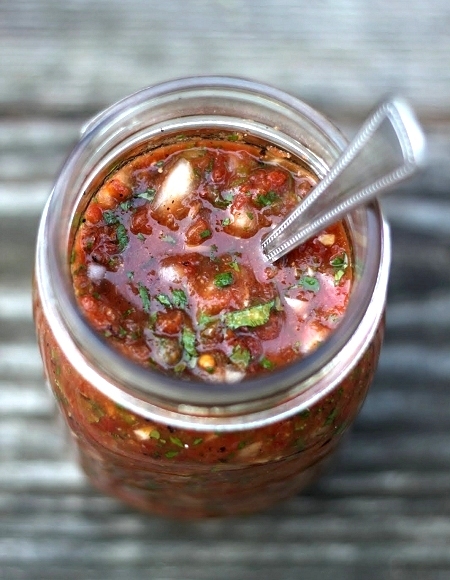 Isn’t it amazing that salsa is the #1 condiment in the United States? We love salsa in our house. Whether it’s a chunky pico de gallo, or a smoky salsa verde – we have yet to meet one we diddn’t like. This recipe is no exception. When I came across it on my friend Josie’s site, I knew it was going to be a winner. First of all, it’s Rick Bayless. The man moved to Mexico for 6 years to better learn the cuisine. He knows his salsa, folks. I also loved the addition of fire-roasted tomatoes as the base. I like using good quality canned tomatoes for the restaurant style salsas that I’ve made in the past, so I knew the flavor could only be amplified by using the fire-roasted variety. The store only had fire-roasted tomatoes with garlic on shopping day, so I adjusted my recipe by reducing the amount of fresh garlic in the recipe by a couple of cloves. My changes are reflected below. The tomatoes lended a smokey sweetness, and the cilantro and lime juice just made it so bright and fresh. Made a nice sized batch that stored in the refrigerator wonderfully for a few days! Heat a small skillet over medium heat, and dry roast the peppers and garlic, until soft and blotchy in spots. The peppers will take about 10 minutes, and the garlic will take about fifteen. Meanwhile, rinse the onion in a fine-mesh strainer under cold water. Shake to dry, and set aside. Stem and peel the jalapenos, and scrape out the seeds and membranes (or leave them if you want the salsa extra spicy)! Peel the garlic, and transfer it to a food processor, along with the jalapenos. Pulse until they are finely chopped, then add the tomatoes (with their juice), and pulse a few more times to make the salsa as smooth or as coarse as you want. Pour the mixture into a medium bowl, and add the onion, cilantro, and lime juice. Stir to combine, and add salt and pepper to taste. Cover and refrigerate, or serve immediately. Who doesn’t love potstickers? I’ve always loved them. I’d always order them from the local chinese restaurant. But, they’re usually flabby and greasy. Neither of which I find to be an appealing trait. So, a few years ago I decided to try to make them at home. My first few attempts I found to be very frustrating, and more or less fruitless. I used the packaged round wontons, and they just wouldn’t cooperate for me. I ended up throwing them all away in disgust. So, when this dish came up in cooking class last fall, I must admit that I was a bit nervous. Visions of balled up dough and bits of ground pork all over the kitchen came flooding back to me. Thankfully, these were a breeze to make. 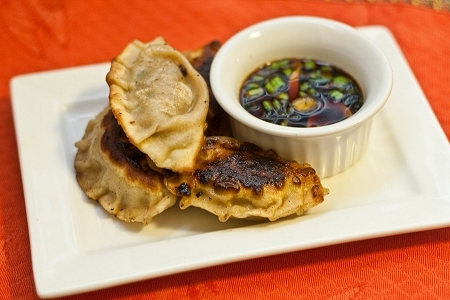 The homemade gyoza wrappers were so much easier to work with than the store-bought variety. ‘Round these parts we like pan-fried dumplings, but feel free to steam, or (Heaven forbid!) deep fry them as well. If you think this batch will make too many for your needs, no worries. They freeze beautifully! Just quick-freeze them on a baking sheet, then place them in a Ziploc bag for storage. Good for up to 3 months. Cook as directed, but add about 7 minutes of cooking time when covered. Stir together flour and 1/2 cup lukewarm water in a bowl until a dough forms. Knead on a lightly floured surface until just smooth, 1 to 2 minutes, then wrap tightly in plastic wrap and let stand at room temperature at least 10 minutes. While dough stands, halve ginger, then finely chop 1 half and cut remaining half into very thin matchsticks (less than 1/8 inch thick). Combine 5 tablespoons soy sauce with ginger matchsticks in a small bowl. Reserve 2 tablespoons scallions to add to the ginger soy dipping sauce. Then finely chop remainder and put in a bowl along with pork, finely chopped ginger, garlic, and remaining 3 tablespoons soy sauce. Gently knead with your hands in bowl until just combined. Chill, covered, 10 minutes. While pork mixture chills, line a large baking sheet with paper towels and dust lightly with flour, then lightly dust a work surface with flour. Halve dough and rewrap 1 half. Pat remaining half into a flat square. Roll out dough into a 13-inch square (less than 1/8 inch thick) with a lightly floured rolling pin, dusting work surface with additional flour as needed, then cut out 12 rounds (very close together) using round cookie cutter. (If dough is sticking to cutter, lightly dip cutter in flour and shake off excess before cutting out each round.) Reserve scraps. Transfer rounds to lined baking sheet and cover loosely with another layer of paper towels lightly dusted (on top) with flour. Roll out remaining half of dough and cut out 12 more rounds in same manner, then transfer rounds to lined baking sheet. Combine scraps of dough and wrap in plastic wrap, then let stand at least 10 minutes. Heat 3 tbsp vegetable oil in non-stick skillet over medium-high heat. Place dumplings in pan and cover, cooking for 7 minutes. Remove lid and continue cooking for an additional 3-5 minutes, until bottom of dumplings are nice and golden brown on the bottom. Remove from pan and drain on paper towel lined plate. Serve with ginger dipping sauce.